The first in a stunning new series, The Cousins War, is set amid the tumult and intrigue of The War of the Roses. 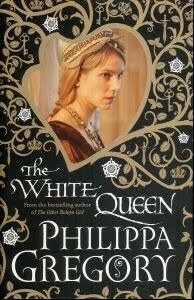 Internationally bestselling author Philippa Gregory brings this family drama to colourful life through its women, beginning with the story of Elizabeth Woodville, the White Queen. The White Queen tells the story of a common woman who ascends to royalty by virtue of her beauty, a woman who rises to the demands of her position and fights tenaciously for the success of her family, a woman whose two sons become the central figures in a mystery that has confounded historians for centuries: the Princes in the Tower whose fate remains unknown to this day. From her uniquely qualified perspective, Philippa Gregory explores the most famous unsolved mystery, informed by impeccable research and framed by her inimitable storytelling skills. Jeg likte boka veldig godt, og den gir et bilde av en utrolig sterk kvinne i en tid der det var menn som styrte både stort og smått. Det skal etterhvert komme flere bøker i denne serien også, og de gleder jeg meg til. Dette innlegget ble publisert i Bokomtaler, historisk roman og merket med Historisk roman, Philippa Gregory, The Cousins' War, The White Queen. Bokmerk permalenken. >Jeg har også lest "The Other Boleyn Girl" som jeg likte godt. Jeg liker stilen til Philippa Gregory og skal lese flere. En dag…Tudortiden er veldig spennende. Synes jeg husker at du også ser på serien? Den er veldig bra, vi har ikke kommet lengre enn til sesong tre, men gleder oss til å se den. >jeg har også lest The other boleyn girl, og har lyt til å lese flere av bøkene til philippa Gregory. kanskje en tur innom Amazon før leggetid hadde vrt en god ide!